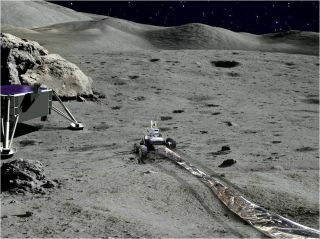 Artist's concept of radio telescope array being emplaced by human-controlled rover on the far side of the moon. The rover would be commanded by astronauts in NASA's Orion spacecraft, which would be hovering in a gravitationally stable spot near the lunar far side called Earth-moon Lagrange Point 2 (L2). Now, a university team has developed a system that mimics rover control to recognize potential problems with human-telerobotic operations, such as time lags and communication quality. Rover researchers at the University of Colorado Boulder. From left to right, Nate Marx, Jack Burns, Ben Mellinkoff and Chris Womack. The team here at the University of Colorado Boulder — led by Jack Burns of the Lunar University Network for Astrophysics Research (LUNAR) — is evaluating how a small rover can spool out lengthy pieces of Kapton film on the lunar far side. Kapton would serve as a robust, lightweight backbone for an array of low-frequency antennas that could be deployed by a modest rover, Burns said. Kapton "arms" would be stretched out on the lunar far side, a location free of the radio-frequency interference churned out by people on Earth. Such rover-deployed antennas would allow scientists to study the formation of the first stars and black holes, among other cosmic phenomena, advocates say. The team has developed a telerobotic simulation system that includes tools for imitating the complications associated with remote rover operations. These tools include methods for mitigating issues of latency — the delay time between stimulus and response — and communication quality between orbiting astronauts and surface-based rovers. "We want to change the paradigm of how you operate rovers on the surface of the moon, Mars and other destinations," Burns told Space.com. "Arms" of Kapton material spread out on the lunar surface could serve as a robust, lightweight backbone for an array of low-frequency antennas that could be deployed by a modest rover. In the course of the experiments, participants used the telerobotic simulation system to control a rover inside the university lab from a command room on the other side of the building. The system consists of three parts: a rover named ARLO (short for Advanced Rover for Lunar Operations), a server to send ARLO commands and a Raspberry Pi (a small, low-power Linux computer) to send real-time video to a user. Also, the researchers added 400 milliseconds of latency to the system to simulate the delay that would be experienced in communication between L2 and the lunar far side. According to Chris Womack, group leader of student researchers involved in the project, the work enables a better appreciation of latency and quality of bandwidth for communications. Those two factors, he said, influence satisfactory telerobotic control by a human. Womack said those factors are called "the cognitive horizon" and the "operational horizon." "We want to find out, on average, what the most effective thresholds are for a human controller," he told Space.com. Furthermore, the research team is reviewing an enlarged suite of rover sensors, such as GPS systems and infrared sensors. Such gear, Womack said, would provide pitch/roll information, location data and more precise distance readings that can be used to help drive a wheeled robot, as well as carry out duties like setting up equipment. The work on the rover-control and latency issues is funded by Lockheed Martin Space Systems Company, which is building the Orion spacecraft for NASA. Burns said that it's apparent to him that the moon is becoming an international target of choice. This impression was hammered home last May at a three-day pan-European lunar science and exploration meeting in Frascati, Italy. Europe, China, Japan, Russia, India and other entities have made clear their moon interests, Burns said. "The other countries are really looking for more U.S. leadership on this." International cooperation could make ambitious moon missions more efficient and affordable, Burns said. And there are lunar locales worth the trek, be they the untapped, water-imbued poles or the moon's far side — both regions that robots or humans have yet to explore. "That's just the logical flow of where things are going to go," Burns said. "The road to Mars is still through the moon and cislunar space. It just has to be. We can't make that jump to Mars without a lot of local practice." But the team's research is also directly applicable to Mars, Burns said. Astronauts orbiting the Red Planet could run a small fleet of rovers more efficiently than Earth-based teams are able to handle NASA's currently operating Curiosity and Opportunity rovers, he said.